In April of 2003, the Iraq Museum in Baghdad was looted of over fifteen thousand priceless artifacts. In only two days, from the 10th to the 12th of April, historical artifacts from ancient Sumerian cities like Uruk, Ur, and Eridu, as well as pieces from Babylon, the Akkadian Empire, and Nineveh, were lost or destroyed. The looters were native to the region, not an invading force, and this made the meaningless destruction of irreplaceable artifacts, not to mention the theft of national treasures, all the more disturbing to the citizens of Iraq and the international community. 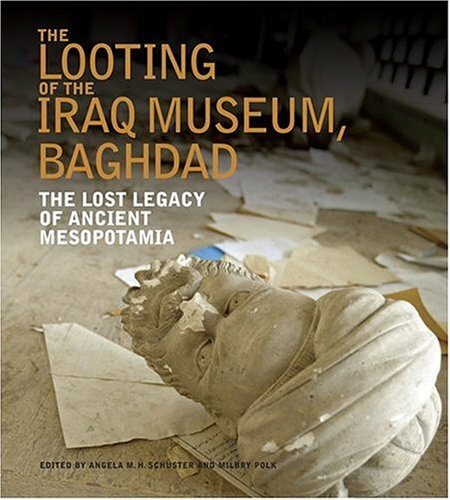 The Looting of the Iraq Museum, Baghdad: The Lost Legacy of Ancient Mesopotamia, edited by Milbry Polk and Angela M.H. Schuster, tells the story of the loss of these treasures but, more importantly, details why they were so valuable and gives a history - with pictures - of the items stolen which have been retrieved, those still missing, and those which were destroyed, seemingly, for no reason. Famous pieces like The Warka Vase (also known as The Uruk Vase) are featured along with lesser known, but equally important, artifacts such as Cylinder Seals. A history of the museum, from its inception to the looting, is given and there are many pictures featured (such as the Akkadian Head of a King, possibly Sargon the Great, and figurines from the Ubaid Period) of the treasures the museum held. A very concise, but comprehensive, history of Mesopotamia is given throughout the work and it is formatted as a `coffee table' book in size and scope. The photos which complement the narrative are stunning and the prose is well written and goes directly to the point of each piece, or epoch, addressed. The narratives are written by professional archaeologists who have excavated in the region or by well-respected scholars on the subject. A percentage of the profit from the sale of the book goes to benefit the preservation of Iraqi antiquities. While it is distressing that so many magnificent works were lost, the book is hopeful in spirit, and inspiring, in the editor's vision of trying to re-create the museum on the page. As the editors write in the Preface, "The Iraq Museum was everyman's museum. Its destruction affects people throughout the world and its loss will remain a hole as we go forward into the future. But if any good can come out of this catastrophic loss, it is in the lessons learned." The editors and contributors go far in making sure a reader understands the lessons which should be learned. They are harsh lessons but, even so, necessary to hopefully prevent anything like the looting of the Iraq Museum from ever happening again. A highly recommended book. Mark, Joshua J. "The Looting of the Iraq Museum, Baghdad: The Lost Legacy of Ancient Mesopotamia." Ancient History Encyclopedia. Last modified February 04, 2014. https://www.ancient.eu/review/45/. Mark, Joshua J. "The Looting of the Iraq Museum, Baghdad: The Lost Legacy of Ancient Mesopotamia." Ancient History Encyclopedia. Ancient History Encyclopedia, 04 Feb 2014. Web. 22 Apr 2019.